Posted bySareesh Sudhakaran	 April 8, 2013 February 17, 2017 1 Comment on What is Color Correction or Color Grading? Color Correction or Grading is the technique of changing the colors present in an image. This could be a stark change (blue to red) or a subtle change (white balance). The difference between the word correction and grading is a gray area (pun intended). If the colors are already perfect, there is no need to change them. If you do change the colors, you could call it your artistic expression (grading) or correction. The audience will only see the final version, no matter the herculean effort that went into changing red into blue. Let’s expand on this a bit. For simplicity, I’m going to use the term color correction. It is what it is. Look at the above image. Color correction is changing the color of a pixel to another color. That’s about it. Everything else pertains to the ‘how you do it’ section. We know an image is a collection of many pixels. Selective color correction is the art of selecting only those pixels we need and changing their values. The first grid shows nine pixels. If we want to isolate just the orange pixel and change its value, we can do it – provided we know the exact color values of that pixel. Since each pixel has an Red, Green and Blue component (RGB), we must know exactly what the values are for each component. This is not a problem of ‘human understanding’, it’s a problem for mathematics. Software is just a bunch of algorithms. The second grid shows nine red pixels, all the same. How do you select one specific pixel from the bunch if you can’t isolate it with color information? The solution is a bunch of techniques that include specifying the exact pixel location, masking, tracking and many others. The third grid shows eight red pixels and one ‘not so red’. Now, if you knew the exact color values of this pixel, you can isolate it using the first method. The unique challenge here is when the algorithm (and human) is not very sure how different the pixels are from one another. This is prevalent in tonality, where smooth gradients sometimes confuse the hell out of an algorithm. Banding is one popular example. The basis of this problem lies in the ‘type of math’ used. My article on the Advantages of Working in 32-bit Float should throw some light on this issue. Don’t be mistaken into thinking dealing with pixels is easy. It takes hardly no time at all for a computer to crunch through nine pixels. A 1080p frame is approximately two million pixels. 4K is about 8 million pixels. 4K video at 24 frames per second is about 200 million pixels per second. You can’t do it on a pixel-by-pixel basis. It takes a whole level of math genius to stay on top of these challenges under the most demanding of circumstances. The fourth problem is the problem of human inadequacy. Our eyes are not perfect. I have gone into this in sufficient detail in Driving Miss Digital. Just for fun, though, stare at the three grids, and you should soon see some new colors! You’ll see. Color correction applications are basically a set of algorithms. If you write one algorithm, it could be a feature (found in most NLEs) or a plug-in (something you can buy or download as an add-on). A whole bunch of algorithms dedicated to the task of color correction makes an application or software. Under the hood, they all do the same thing. The differences lie in the details, not in the quality of the math. My favorite color correction and grading application is Adobe After Effects, as surprising as it may seem. It has enough tools to handle the most demanding of tasks. A computer keyboard and mouse is a versatile duo. Unfortunately, as gamers know only too well, they’re not always suitable for all scenarios. 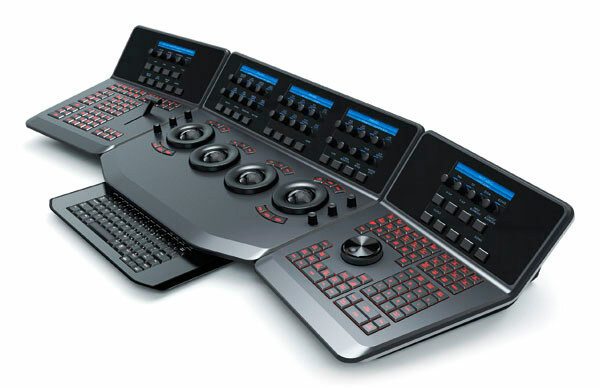 Similarly, color correction or grading artists, called Colorists, have the option to use special hardware control devices (called surfaces) to make their life easier. These surfaces are designed for supreme ergonomic advantages, and work similarly to analog audio mixers. By now you should have a general idea of what color correction or color grading is, and what it involves. As with all things, keeping things simple is the best way to tackle any ‘color problem’. An even easier method is to get it right on set. Thank you for sharing this great information. In this post give good explanation in detail that helpful for many people also step by step explanation in detail that very helpful.